Sydenham Hill is a hill and an affluent locality in southeast London. 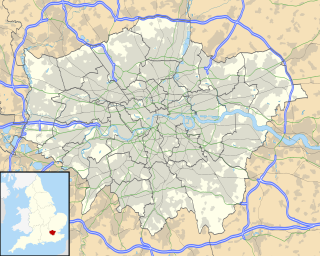 It is also the name of a road which runs along the northeastern part of the ridge, forming the boundary between the London Borough of Southwark, London Borough of Bromley and the London Borough of Lewisham. The highest part of the hill is the highest point of the Boroughs of both Southwark and Lewisham, as well as being one of the highest points in the whole of London, at 367 feet (112 m). South Kensington is an affluent district of West London in the Royal Borough of Kensington and Chelsea. 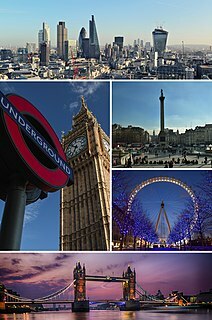 With some of its easterly areas shared with the City of Westminster, the district is known as a popular tourist destination due to its density of museums and culutral landmarks. In the United Kingdom, non-departmental public body (NDPB) is a classification applied by the Cabinet Office, Treasury, the Scottish Government and the Northern Ireland Executive to quangos. NDPBs are not an integral part of any government department and carry out their work at arm's length from ministers, although ministers are ultimately responsible to Parliament for the activities of bodies sponsored by their department. Sir Francis Neville Richards is a former British civil servant and diplomat who was Governor and Commander-in-Chief of Gibraltar from 2003 to 2006, and the director of the Government Communications Headquarters from 1998 to 2003. Alfred Moritz Mond, 1st Baron Melchett, PC, FRS, DL, known as Sir Alfred Mond, Bt, between 1910 and 1928, was a British industrialist, financier and politician. In his later life he became an active Zionist. William Martin Conway, 1st Baron Conway of Allington, known between 1895 and 1931 as Sir Martin Conway, was an English art critic, politician, cartographer and mountaineer, who made expeditions in Europe as well as in South America and Asia. 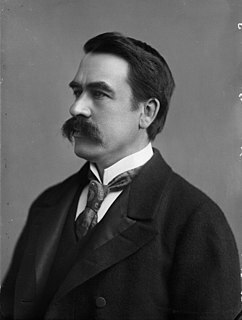 Charles John ffoulkes (1868–1947) was a British historian, and curator of the Royal Armouries at London. He wrote extensively on medieval arms and armour. 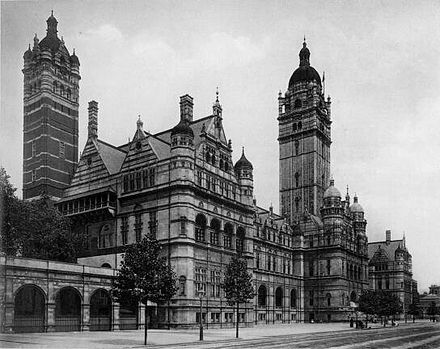 In 1924 the museum moved to the Imperial Institute building (demolished in the 1950s and 1960s to make way for Imperial College) in South Kensington. While this location was more central and in a prestigious area for museums, the accommodation itself proved cramped and inadequate  and in 1936 a new permanent location was found south of the River Thames in Southwark. The building, designed by James Lewis  was the former Bethlem Royal Hospital which had been vacated following the hospital's relocation to Beckenham in Kent. The site was owned by Lord Rothermere, who had originally intended to demolish the building entirely in order to provide a public park in what was a severely overcrowded area of London. Eventually the central portion of the hospital building was retained while its two extensive wings were removed and the resulting space named Geraldine Mary Harmsworth Park, after Lord Rothermere's mother. Sir Martin Conway described the building as '...a fine building, really quite noble building, with a great portico, a distinguishing dome, and two great wings added to it for the accommodation of lunatics no longer required. This particular building can be made to contain our collection admirably, and we shall preserve from destruction quite a fine building which otherwise will disappear'. The 'distinguishing dome' was added by Sydney Smirke in 1846 and housed the hospital's chapel. The museum was reopened by the Duke of York (later King George VI) in its new accommodation on 7 July 1936. The following year, 2000, the final phase of the Southwark redevelopment was completed. The development included the installation of the museum's Holocaust Exhibition which was opened by the Queen on 6 June 2000. This was the first permanent exhibition dedicated to the Holocaust in a UK museum; its development had taken five years at a cost of £5 million. Two years later, in July 2002, Imperial War Museum North was opened. From the 1970s onwards the Imperial War Museum began to expand onto other sites. The first branch, Imperial War Museum Duxford opened to the public on a regular basis in June 1976. HMS Belfast became a branch of the museum in 1978. The Cabinet War Rooms opened in 1984, and Imperial War Museum North in 2002. Imperial War Museum Duxford, near the village of Duxford in Cambridgeshire, is Britain's largest aviation museum. Duxford houses the museum's large exhibits, including nearly 200 aircraft, military vehicles, artillery and minor naval vessels in seven main exhibitions buildings. The site also provides storage space for the museum's collections of film, photographs, documents, books and artefacts. The site accommodates a number of British Army regimental museums, including those of the Parachute Regiment and the Royal Anglian Regiment. Based on the historic Duxford Aerodrome, the site was originally operated by the Royal Air Force (RAF) during the First World War. During the Second World War Duxford played a prominent role during the Battle of Britain and was later used by United States Army Air Forces fighter units in support of the daylight bombing of Germany. Duxford remained an active RAF airfield until 1961. Many of Duxford's original buildings, such as hangars used during the Battle of Britain, are still in use. A number of these buildings are of architectural or historic significance and over thirty have listed building status. The site also features a number of purpose-built exhibition buildings, such as the Stirling Prize-winning American Air Museum, designed by Sir Norman Foster. The site remains an active airfield and is used by a number of civilian flying companies, and hosts regular air shows. The site is operated in partnership with Cambridgeshire County Council and the Duxford Aviation Society, a charity formed in 1975 to preserve civil aircraft and promote appreciation of British civil aviation history. The Cabinet War Rooms is an underground complex that served as a British government command centre throughout the Second World War. Located beneath the Treasury building in the Whitehall area of Westminster, the facilities became operational in 1939 and were in constant use until their abandonment in August 1945 after the surrender of Japan. Their historical value was recognised early on, and the public were able to visit by appointment. However, the practicalities of allowing public access to a site beneath a working government office meant that only 4,500 of 30–40,000 annual applicants to visit the War Rooms could be admitted. The museum agreed to take over the administration of the site in 1982,  a development keenly supported by the then Prime Minister Margaret Thatcher, an admirer of Britain's wartime Prime Minister Winston Churchill. Thatcher opened the War Rooms in April 1984. In 2003 a further suite of rooms, used as accommodation by Churchill, his wife and close associates, were added to the museum. The restoration of these rooms, which since the war had been stripped out and used for storage, cost £7.5 million. In 2005 the War Rooms were rebranded as the Churchill Museum and Cabinet War Rooms, with 850 m2 of the site redeveloped as a biographical museum exploring Churchill's life. The development of the Churchill Museum cost a further £6 million. The centrepiece is a 15m interactive table which enables visitors to access digitised material, particularly from the Churchill Archives Centre, via an "electronic filing cabinet". The museum was renamed the Churchill War Rooms in 2010. The War Memorials Register is a database of known war memorials in the United Kingdom. Information material used in composition, the condition of the memorial, its address and coordinates with a satellite map plot are recorded for each of the memorials. There are over 70,000 memorials on the register. Whilst many memorials are commemorated to those who died in the First World War,  the scope of the project is all conflicts. Imperial War Museum North is a museum in the Metropolitan Borough of Trafford in Greater Manchester, England. One of five branches of the Imperial War Museum, it explores the impact of modern conflicts on people and society. It is the first branch of the Imperial War Museum to be located in the north of England. The museum occupies a site overlooking the Manchester Ship Canal in Trafford Park, an area which during the Second World War was a key industrial centre and consequently heavily bombed during the Manchester Blitz in 1940. The area is now home to the Lowry cultural centre and the MediaCityUK development, which stand opposite the museum at Salford Quays. Imperial War Museum Duxford is a branch of the Imperial War Museum near Duxford in Cambridgeshire, England. Britain's largest aviation museum, Duxford houses the museum's large exhibits, including nearly 200 aircraft, military vehicles, artillery and minor naval vessels in seven main exhibition buildings. The site also provides storage space for the museum's other collections of material such as film, photographs, documents, books and artefacts. The site accommodates several British Army regimental museums, including those of the Parachute Regiment and the Royal Anglian Regiment. Langlands & Bell are two artists who work collaboratively. Ben Langlands and Nikki Bell, began collaborating in 1978, while studying Fine Art at Middlesex Polytechnic in North London, from 1977 to 1980. Paul Seawright is a Northern Irish artist. Seawright is the professor of photography and the Executive Dean of Arts, Humanities and Social Sciences at Belfast School of Art at Ulster University in Belfast. He lives in his birthplace of Belfast. Anna Airy was an English oil painter, pastel artist and etcher. She was one of the first women officially commissioned as a war artist and was recognised as one of the leading women artists of her generation. Duxford Aerodrome is located 8 nautical miles south of Cambridge, within the Parish of Duxford, Cambridgeshire, England and nearly 1-mile (1.6 km) west of the village. Tirpitz was a pig captured from the Imperial German Navy after a naval skirmish following the Battle of the Falkland Islands in 1914. She became the mascot of the cruiser HMS Glasgow. Donovan Wylie is a British photographer from Northern Ireland, based in Belfast. His work chronicles what he calls "the concept of vision as power in the architecture of contemporary conflict" – prison, army watchtowers and outposts, and listening stations – "merging documentary and art photography". Anthony Noble Frankland CB, CBE, DFC,, is a British historian and a former Director General of the Imperial War Museum. Ethel Léontine Gabain was a French-English artist. Gabain was a renowned painter and lithographer and among the founding members of the Senefelder Club. She was the wife of the print maker John Copley and the mother of actor Peter Copley, and was also known by her married name of Ethel Copley. While she was known for her oil portraits of actresses, Gabain was one of the few artists of her time able to live on the sale of her lithographs. She also did etchings, dry-points, as well as some posters. The First World War Centenary is the centenary of the First World War, which started on 28 July 2014 with commemorations of the outbreak of the war and ended on 11 November 2018. Project Vitello was a military operation that transferred the 9.2-inch Mark X breech-loading gun at Spur Battery in the British Overseas Territory of Gibraltar to the Imperial War Museum in Duxford, Cambridgeshire, England. Project Vitello I, the first phase, entailed the dismantling of the gun by the Royal Engineers at the artillery battery and transporting it to the Gibraltar dockyard in 1981. It was then shipped to Portsmouth on a Royal Fleet Auxiliary vessel. Project Vitello II, the second phase, began with the arrival of the gun in Portsmouth and involved transporting the gun to the Duxford Aerodrome. The Royal Engineers not only reassembled the gun and its mount, but also constructed a base, shell pit, and parapet, with the operation completed in 1982. The Gibraltar Gun was inaugurated that year by Sir John Grandy, Chairman of the Trustees of the Imperial War Museum. The War Artists Advisory Committee (WAAC), was a British government agency established within the Ministry of Information at the outbreak of the Second World War in 1939 and headed by Sir Kenneth Clark. Its aim was to compile a comprehensive artistic record of Britain throughout the war. This was achieved by appointing official war artists who were sent to specific locations to capture how the war affected the area. James Morris, was a British war artist during the Second World War. Kathleen Saywell Allen (1906–1983) was a British painter, muralist, designer and art teacher. Allen is known for her urban landscapes and, in particular, scenes depicting post-war rebuilding in London. ↑ Whitmore, Mark (letter to Frankie Roberto) (12 May 2008) WhatDoTheyKnow.com Total number of objects in the Imperial War Museum's collection. Retrieved 28 October 2009. ↑ Imperial War Museums. "About us". iwm.org.uk. Retrieved 28 August 2012. ↑ "Imperial War Museum London". Museums - The World Museums Network. ↑ Kavanagh, Gaynor (January 1988). "Museum as Memorial: The origins of the Imperial War Museum". Journal of Contemporary History . 23 (1): 77–97 . doi:10.1177/002200948802300105. ISSN 0022-0094. JSTOR 260869. ↑ Kavanagh, Gaynor (1994). Museums and the First World War. Continuum International Publishing Group. p. 137. ISBN 0-7185-1713-X . Retrieved 30 January 2012. 1 2 Office of Public Sector Information Revised Statute from The UK Statute Law Database: Imperial War Museum Act 1920 (c.16). Retrieved 14 April 2010. ↑ Hansard, 12 April 1920 Imperial War Museum Bill HC Deb 12 April 1920 vol 127 cc1465-9 Hansard 1803–2005 Accessed 22 March 2009. ↑ Their Past Your Future. "Learning Resources for Teaching History – Key Stages 3 and 4 – The Imperial War Museum" (PDF). Imperial War Museum. Retrieved 18 March 2011. ↑ Conway was addressing the House of Lords and his words recorded in Hansard. Quoted in Cooke, Steven; Jenkins, Lloyd (December 2001). "Discourses of Regeneration in Early Twentieth-Century Britain: From Bedlam to the Imperial War Museum". Area. Blackwell Publishing for The Royal Geographical Society. 33 (4): 382–390 . doi:10.1111/1475-4762.00044. ISSN 0004-0894. JSTOR 20004179. ↑ Alberto Cavalcanti (director)/GPO Film Unit (November 1939). "the FIRST DAYS". Imperial War Museum Collection Search. Imperial War Museum. Retrieved 12 October 2012. 1 2 Charman, Terry (2008). A Museum of Man's Greatest Lunatic Folly: The Imperial War Museum and its Commemoration of the Great War 1917–2008 in A Part of History: Aspects of the British Experience of the First World War. London: Continuum. p. 103. ISBN 978-0-8264-9813-7. ↑ Imperial War Museum. "Reopening of the Imperial War Museum, London after the Second World War 1946 (D 29420, caption)". archive.iwm.org.uk. Retrieved 1 April 2013. ↑ Imperial War Museum. "Naval guns, 15-inch". archive.iwm.org.uk. Retrieved 25 February 2012. ↑ Wingate, John (2004). In Trust for the Nation: HMS Belfast 1939–1972. London: Imperial War Museum. p. 101. ISBN 1-901623-72-6. ↑ Frankland, Noble (1999). History at War. London: Giles de la Mare. pp. 205–208. ISBN 978-1-900357-10-4. 1 2 3 4 Pearce, David; Penton, Annelise (2002). "The Imperial War Museum, London – Stage 3" (PDF). The Arup Journal. Arup. 37 (2): 42–47. Archived from the original (PDF) on 3 June 2013. Retrieved 25 March 2012. ↑ Hansard, 17 July 1989 Imperial War Museum – HC Deb 17 July 1989 vol 157 cc13-4 Hansard 1803 –2005. Retrieved 16 March 2009. ↑ "Spitfire/R6915". Warbirds Resource Group. Retrieved 16 February 2012. ↑ Kirby, Terry (18 September 1992). "Firebombs found at three tourist venues in London". The Independent . Retrieved 6 April 2009. ↑ Hansard, 4 March 1996 Terrorist Incidents – HC Deb 4 March 1996 vol 273 cc51-62W Hansard 1803–2005. Retrieved 6 April 2009. ↑ For details of the development process of the Holocaust Exhibition see Bardgett, Suzanne (June 2000). "Exhibiting Hatred". History Today. 50 (6): 18–21. ISSN 0018-2753. .
↑ Morris Hargreaves Mcintyre (27 October 2006). "Evaluation of the Veterans Reunited Programme" (PDF). Manchester. pp. 5–6. Retrieved 2 March 2011. ↑ Morris Hargreaves Mcintyre (27 October 2006). "Evaluation of the Veterans Reunited Programme" (PDF). Manchester. p. 51. Retrieved 2 March 2011. ↑ Morris Hargreaves Mcintyre (27 October 2006). "Evaluation of the Veterans Reunited Programme" (PDF). Manchester. p. 77. Retrieved 2 March 2011. ↑ Morris Hargreaves Mcintyre (18 March 2010). "You can't ask a textbook a question: An evaluation of The Immersive Learning Programme, Their Past Your Future 2, Imperial War Museum" (PDF). Manchester. pp. 4–5. Retrieved 2 March 2011. ↑ University of London Computer Centre. "TPFY Digital Archive" . Retrieved 2 March 2011. ↑ Imperial War Museum. "Their Past Your Future: Learning Resources for Teaching History" . Retrieved 2 March 2011. ↑ Imperial War Museum (3 October 2011). "IWM Launches New Brand" (PDF). iwm.org.uk. Retrieved 6 March 2012. ↑ NESTA (26 September 2011). "Eight finalists chosen to pioneer digital R&D projects" . Retrieved 14 April 2012. ↑ Audas, Jane (13 April 2012). "Innovation in arts and culture #2: the Social Interpretation project at IWM". The Guardian . Retrieved 14 April 2012. ↑ Clarence House (9 December 2010). "Prince William to become Patron of the Imperial War Museum Foundation's First World War Centenary Appeal" . Retrieved 9 December 2010. ↑ "Plans to mark World War I centenary announced". number10.gov.uk. HM Government. 11 October 2012. Retrieved 12 October 2012. ↑ Imperial War Museum (2013). "Transforming IWM London". iwm.org.uk. Archived from the original on 6 September 2013. Retrieved 15 September 2013. ↑ "Foster + Partners adds First World War galleries to London's Imperial War Museum". Dezeen. 2014. Retrieved 6 December 2014. ↑ "Listings - IWM London: October, November and December 2012 [press release]" (PDF). IWM. 25 September 2012. Retrieved 15 September 2013. ↑ "Battle of Britain Spitfire set to leave IWM London before museum temporarily closes for six months from 2 January – July 2013 [press release]" (PDF). IWM. 13 December 2012. Retrieved 15 September 2013. ↑ "IWM London partially re-opens [press release]" (PDF). IWM. 29 July 2013. Retrieved 15 September 2013. ↑ English, Rebecca (17 July 2014). "Prince William and David Cameron officially open Imperial War Museum's new First World War galleries as visits begin following £40m refurbishment". Daily Mail. Retrieved 18 July 2014. ↑ Wingate, John (2004). In Trust for the Nation: HMS Belfast 1939–1972. London: Imperial War Museum. p. Postscript. ISBN 1-901623-72-6. 1 2 Darlington, Ida, ed. (1955). "Bethlem Hospital (Imperial War Museum)". Survey of London: volume 25: St George's Fields (The parishes of St. George the Martyr Southwark and St. Mary Newington). British History Online. pp. 76–80. Retrieved 29 January 2012. ↑ Historic England. "Imperial War Museum (1385640)". National Heritage List for England . Retrieved 8 January 2012. ↑ Heritage Lottery Fund – Second World War 60 Years On: remembering, learning, commemorating Archived 25 March 2009 at the Wayback Machine Accessed 10 March 2009. ↑ Imperial War Museum (2009) Imperial War Museum London map Accessed 12 April 2010. ↑ Moss, Richard (9 November 2010). "Extraordinary stories revealed as the Imperial War Museum opens The Lord Ashcroft Gallery". Culture24 . Retrieved 12 November 2010. ↑ Archives in London and the M25 Area All Saints Hospital. Retrieved 20 August 2009. ↑ Lost Hospitals of London. Retrieved 14 April 2010. ↑ For a list of aircraft, vehicles and boats at Duxford, see "IWM Duxford: Aircraft and Vehicles" (PDF). Imperial War Museum. November 2011. Retrieved 2 February 2012. ↑ Imperial War Museum Duxford (2009) Historic Duxford Archived 1 October 2009 at the Wayback Machine . Retrieved 15 September 2009. ↑ "HMS "Belfast" (Hansard, 19 January 1978)". hansard.millbanksystems.com. Retrieved 21 August 2009. ↑ Young, David (27 September 2017). "New Royal Navy warship to be named HMS Belfast". Irish Times. Press Association. Retrieved 27 September 2017. ↑ Kennedy, Maev (9 April 2003) The Guardian Restored underground apartments opened to public. Retrieved 28 July 2009. ↑ "Peel Holdings milestones". Manchester Evening News . 3 February 2005. Retrieved 28 January 2012. ↑ Herbert, Ian (3 July 2002) The Independent Libeskind's war museum triumphs over cost-cutters. Retrieved 9 October 2009. ↑ Hughes, Matthew (Winter 2002) Institute of Historical Research: History in Focus The Imperial War Museum (North): The Triumph of Style over Substance?. Retrieved 9 October 2009. ↑ Worsley, Giles (29 June 2002) The Daily Telegraph A globe ripped to pieces. Retrieved 20 November 2009. ↑ Imperial War Museum Photograph no. E 18980, Montgomery's Grant tank, office caravan, bedroom caravan, map caravan and staff car. Imperial War Museum Collections Search. Retrieved 28 January 2012. ↑ The National Archives (2012). "Montgomery, Bernard Law (1887–1976) 1st Viscount Montgomery, Field Marshal". National Register of Archives: Person details: Archive details. Retrieved 26 January 2012. ↑ Imperial War Museum (2012). "Private Papers of Field Marshal Sir John French". Imperial War Museum Collections Search. Retrieved 25 February 2012. ↑ Richards, Anthony (2004). "Archive Report: The Department of Documents at the Imperial War Museum". Contemporary British History. Routledge. 18 (2): 103–112. doi:10.1080/1361946042000227751. ↑ Imperial War Museum (2012). "About the Collections: Documents". iwm.org.uk. Retrieved 11 August 2012. 1 2 3 4 5 6 7 8 Imperial War Museum (2012). Imperial War Museum Annual Report and Account 2011–2012 (PDF). London: The Stationery Office. p. 62. ISBN 9780102976571 . Retrieved 11 August 2012. 1 2 Imperial War Museum (2012). "About the Collections: Art and Popular Design". iwm.org.uk. Retrieved 11 August 2012. ↑ Malvern, Sue (Spring 2000). "War, Memory and Museums: Art and Artefact in the Imperial War Museum'". History Workshop Journal. Oxford University Press. 49: 177–203. doi:10.1093/hwj/2000.49.177. JSTOR 4289665. ↑ "Gassed (Art.IWM ART 1460)". Imperial War Museum Collection Search. Retrieved 11 August 2012. ↑ "The Hall of Remembrance". The Imperial War Museum. Retrieved 2 June 2014. ↑ Foss, Brian (1991). "Message and Medium: Government Patronage, National Identity and National Culture in British 1939–1945". Oxford Art Journal. Oxford University Press. 14 (2): 52–72 . doi:10.1093/oxartj/14.2.52. ISSN 0142-6540. JSTOR 1360524. ↑ Imperial War Museum. "Contemporary War Artists: Introduction". archive.iwm.org.uk. Retrieved 25 February 2012. ↑ Imperial War Museum. "Falklands War 1982, Linda Kitson's artistic record". archive.iwm.org.uk. Retrieved 11 August 2012. ↑ Imperial War Museum. "Gulf War 1991, John Keane's artistic record". archive.iwm.org.uk. Retrieved 11 August 2012. ↑ "Cleansed, 1994 (Art.IWM ART 16521)". Imperial War Museum Collection Search. Retrieved 11 August 2012. ↑ The Art Fund. "Queen and Country: A project by Steve McQueen". www.artfund.org. Archived from the original on 5 August 2012. Retrieved 11 August 2012. ↑ Langlands & Bell. "The House of Osama bin Laden". www.langlandsandbell.com. Archived from the original on 2 May 2012. Retrieved 11 August 2012. ↑ Visual Arts Data Service (2008). "Imperial War Museum: Concise Art Collection". ; "Imperial War Museum: Posters of Conflict". ; "Imperial War Museum: Spanish Civil War Poster Collection". University for the Creative Arts . Retrieved 11 August 2012. ↑ "Google Art Project: Imperial War Museums". Google Art Project . 2012. Retrieved 6 May 2012. ↑ 'The world’s first specialist—or non-fiction—film archive...is recognised as that of the Imperial War Museum'; editor's note in Trujillo, Iván (October 2003). Daudelin, Robert, ed. "2003 FIAF Award to Ingmar Bergman" (PDF). Journal of Film Preservation. Fédération Internationale des Archives du Film – FIAF. 66: 33. ISSN 1609-2694. Archived from the original (PDF) on 25 July 2011. Retrieved 22 December 2010. ↑ '...perhaps the strongest claimant to being the first authentic, authorized film archive is Britain’s Imperial War Museum' in Jeavons, Clyde (April 2007). Daudelin, Robert, ed. "The Moving Image: Subject or Object?" (PDF). Journal of Film Preservation. Fédération Internationale des Archives du Film – FIAF. 66: 25. ISSN 1609-2694. Archived from the original (PDF) on 25 July 2011. Retrieved 22 December 2010. ↑ For the early history of the Imperial War Museum film archive, see Smither, Roger; Walsh, David (2000). "Unknown Pioneer: Edward Foxen Cooper and the Imperial War Museum Film Archive 1919–1934". Film History. Indiana University Press. 12 (2): 187–203. ISSN 0892-2160. JSTOR 3815371. ↑ Der Magische Gürtel (film) (2000 restoration ed.). Europa Film Treasures. Archived from the original on 30 November 2009. ↑ Haggith, Toby (2002). "D-Day Filming: For Real. A Comparison of 'Truth' and 'Reality' in "Saving Private Ryan" and Combat Film by the British Army's Film and Photographic Unit". Film History. Indiana University Press. 14 (3/4): 332–353. doi:10.2979/fil.2002.14.3-4.332. JSTOR 3815436. ↑ Caven, Hannah (2001). "Horror in Our Time: Images of the concentration camps in the British media, 1945". Historical Journal of Film, Radio and Television. Routledge. 21 (3): 205–253. doi:10.1080/01439680120069399. ↑ "Imperial War Museum Film Archive". Moving History: A guide to UK film and television archive in the public sector. Arts and Humanities Research Board. Archived from the original on 22 February 2012. Retrieved 12 August 2012. ↑ "Collection search for "e brooks"". Collection Search. Imperial War Museum. Retrieved 28 August 2012. ↑ "Collection search for "j w brooke"". Collection Search. Imperial War Museum. Retrieved 28 August 2012. ↑ Hudson, Alex (2 November 2012). "Flower beds that meant death for German WWI soldiers". BBC News. Retrieved 8 September 2012. ↑ "The National Collection of Aerial Photography: Links". aerial.rcahms.gov.uk. Royal Commission on the Ancient and Historical Monuments of Scotland . Retrieved 8 September 2012. ↑ "Collection search for "bert hardy"". Collection Search. Imperial War Museum. Retrieved 28 August 2012. ↑ "Flag, Red Ensign, Canadian". Collection Search. Imperial War Museum. Archived from the original on 30 April 2013. Retrieved 25 August 2012. 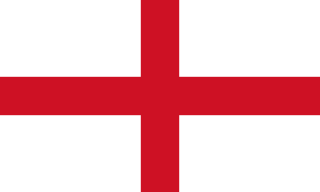 ↑ "Flag, National, British, Union flag". Collection Search. Imperial War Museum. Retrieved 25 August 2012. 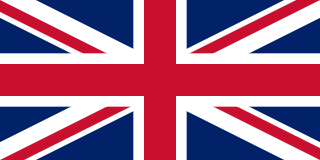 ↑ "Union flag". Collection Search. Imperial War Museum. Retrieved 25 August 2012. ↑ "Trench Art". Collections in Context. Imperial War Museum. Retrieved 26 August 2012. ↑ "Collections Search for "trench art"". Collection Search. Imperial War Museum. Retrieved 26 August 2012. ↑ "Collections Search for "trench club"". Collection Search. Imperial War Museum. Retrieved 26 August 2012. ↑ "Rifle, Short, Magazine, Lee Enfield, .303 inch, Mk 3". Collection Search. Imperial War Museum. Retrieved 26 August 2012. ↑ "Colt Government Model (civilian, 1911)". Collection Search. Imperial War Museum. Retrieved 26 February 2012. ↑ "QF 13 pdr Mk 1 (Néry Gun)". Collection Search. Imperial War Museum. Retrieved 26 August 2012. ↑ "AEC B Type Bus (B43 Old Bill)". Collection Search. Imperial War Museum. Retrieved 18 February 2012. ↑ "Collection Search for "montgomery" (vehicles, aircraft and ships)". Collection Search. Imperial War Museum. Retrieved 26 August 2012. ↑ Parsons, Gary (2005) 'TSR2 cubed' AirSceneUK.org.uk. Accessed 28 September 2009. ↑ "ship, Coastal Motor Boat (CMB 4) – MAR 563". Collections Search. Imperial War Museum. Retrieved 26 August 2012. ↑ "Submersible, Midget Submarine XE8, British". Collections Search. Imperial War Museum. Retrieved 26 August 2012. 1 2 "Imperial War Museum Collections". copac.ac.uk. University of Manchester. Retrieved 8 September 2012. ↑ British Library. "The Imperial War Museum's Stamp Collection". Help for Researchers: Philatelic Collections: General Collections. Retrieved 3 October 2012. ↑ Imperial War Museum (2012). "About the Collections: Sound". iwm.org.uk. Retrieved 23 September 2012. ↑ Lance, David (October 1977). "Sound Archive of Recordings Opens to the Public". Social History. 2 (6): 803–804. doi:10.1080/03071027708567412. JSTOR 4284738. ↑ Peter Naughton (20 October 2012). "Podcast and Internet Radio previews: Voices of the First World War and Here's the Thing". telegraph.co.uk. Retrieved 16 November 2012. ↑ "War Memorials Register". Imperial War Museum. Retrieved 9 January 2018. ↑ "UK War Memorials Register". The Great War 1914-1918. Retrieved 9 January 2018. ↑ "Lives of the First World War launch - February 2014". The Great War Forum. 8 November 2013. Retrieved 20 March 2019. ↑ "IWM & brightsolid partner to create Lives of the First World War digital memorial - Family Tree". family-tree.co.uk. Archived from the original on 7 December 2014. Retrieved 2018-01-09. ↑ "Knowledge Base - Help and Support for Lives of the First World War". support.livesofthefirstworldwar.org. Retrieved 2018-01-09. ↑ "How long will the site be available for?". support.livesofthefirstworldwar.org. Archived from the original on 18 August 2015. Retrieved 2018-01-09. IWM has made a commitment that Lives of the First World War will be an interactive platform available to the public throughout the four years of the centenary, and that the permanent digital memorial will be saved for future generations. ↑ "How long will the site be available for?". support.livesofthefirstworldwar.org. Retrieved 2017-03-31. From early 2019 the memorial will become part of IWM’s archive, and will be free to access [online] for research. ↑ Office of Public Sector Information Revised Statute from The UK Statute Law Database: Imperial War Museum Act 1955 (c.14). Retrieved 14 April 2010. ↑ Imperial War Museum (2012) Our Trustees: Trustee Profiles. Retrieved 6 January 2012. ↑ Imperial War Museum (September 2006) Imperial War Museum Corporate Governance Code. Retrieved 14 April 2010. ↑ Perowne, B C. "Martin, Sir Douglas Eric Holland- (1906–1977)". Oxford Dictionary of National Biography. Oxford University Press. Retrieved 15 July 2010. ↑ Brock, P W. "Sir Algernon Usborne Willis (1889–1976)". Oxford Dictionary of National Biography. Oxford University Press. Retrieved 15 July 2010. ↑ Probert, Henry A. "Grandy, Sir John (1913–2004)". Oxford Dictionary of National Biography. Oxford University Press. Retrieved 15 July 2010. ↑ Barrass, M B (2001–2008). "Marshal of the RAF Sir John Grandy (32078)". Air of Authority – A History of RAF Organisation. Retrieved 15 July 2010.